Luxury 3 Bedroom, 2.5 bath pool home, prime Citrus Hills location. 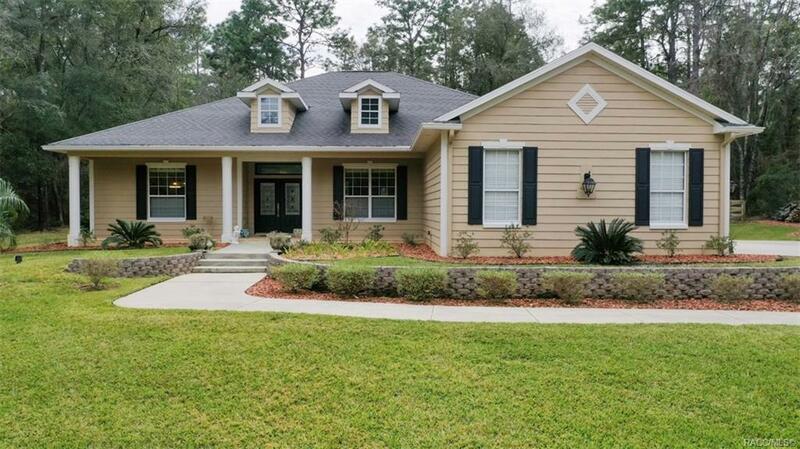 Beautifully landscaped, peaceful one acre wooded setting. NO MANDATORY MEMBERSHIP, LOW HOA FEE. Outstanding condition with distinct formal and informal areas - living room, dining room, family room with gas fireplace, open floor plan, architectural details. Abundant space, full array of designer features; custom window treatments, wood floors, crown molding, wide wood work, beautiful kitchen with custom wood cabinets, upscale stainless steel appliances, solid-surface counters; decorator lighting, fixtures and fans. Low utility bills â very energy efficient with recent top of the line Trane heat pump, new (2019) cost-saving gas tankless water heater. Large Master Suite, spacious baths and closets, oversize garage plus separate workshop or hobby room. New 10x16 Cook custom garden shed, fenced backyard for your pets and large extended driveway. Cannot be duplicated for this price. One owner is a Florida Realtor. Directions: From Hwy 491 Take 486e To Right On Essex Avenue, Right On Keller, Left On Fresno, Right On Person, Left On Nashville Then Right On Stafford, 1st House On The Left.